I’ve been pulling together the agenda for Affiliate Summit on our site in the same way for as long as I can remember. And it didn’t occur to me that it wasn’t particular user friendly until I saw a Tweet about it before Affiliate Summit East 2013. I hadn’t changed it over the years, because nobody ever commented on it. But after getting this feedback, I started asking around, and lots of people told me they thought it was clumsy and difficult to navigate. So, when I returned home from Philadelphia, I wanted to make a much better one for the future. So, now we’ve got a brand new layout for Affiliate Summit West 2014, and I think it’s a whole lot more of a useful resource, and hopefully not a hassle for anybody (if it is, let me know!). For starters, the default view has all of the events collapsed to keep the agenda compact, and the date and time is on every individual listing on the agenda. But if you click “Expand All” at the top of the agenda, you will see details for each item. In this mode, you can see further details, and in the case of the educational sessions, you’ll see the descriptions, experience level, target audience, niche/vertical, and speaker(s). Click on “Read More” for any agenda item, and you will be brought to a page with all of those details, as well as the option to share the page, add it to your calendar, register for the conference, and enter your email address to receive a notification about the event 6 hours before it starts. The new look also has an option to print if you wish, but bear in mind that we’ll have an app as we get closer to the conference with all of the details, and the agenda will be printed out in the January 2014 issue of FeedFront magazine. Finally, if you click on “Agenda” at the top, you can change the way you view the overall agenda. Other options are Posterboard, Stream, and Day. I hope you find this evolution of our agenda more useful. I am pretty excited about it. Affiliate Summit Press, a new publishing arm of Affiliate Summit, has put out the first in a series of books aimed at the digital marketing space called Online Shopping is Broken: How to Fix It. The book is based on short essays from U.S. college students who answered the question, “What is your biggest frustration with online shopping and how would you suggest fixing it?,” in 250-500 words. The essays were part of a contest from Affiliate Summit, where we provided ten scholarships of $1,000 each to college students, based on their essay entries. Winners were selected by the Affiliate Summit Advisory Board. The book includes the winning entries, as well as the others that were submitted, which conformed to the minimum or maximum word count. Keep an eye out for more Affiliate Summit Press books. Affiliates were asked “How do you typically find out about new affiliate programs? 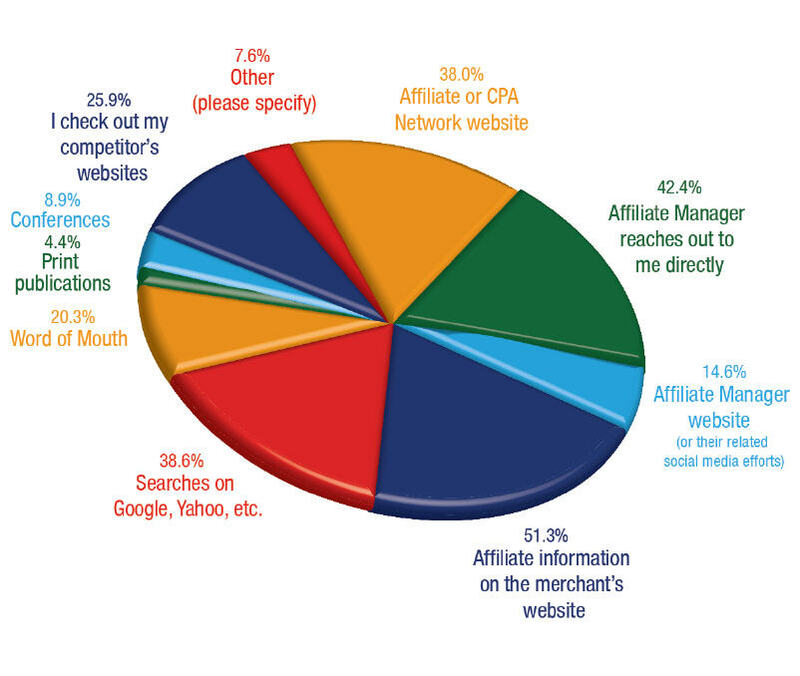 Select all that apply.” for the 2013 Affiliate Summit AffStat Report. Finding the information on a merchant site was most common with 51.3% of affiliates, followed by affiliate managers reaching out to the affiliates at 42.4%. Other common answers were searches in the search engines, checking out competitor’s sites, and within the network sites. When I am looking to apply to an affiliate program, I am typically in the camp of the most common choice, as I know I want to promote a specific company, and I visit their site to look for affiliate program details. 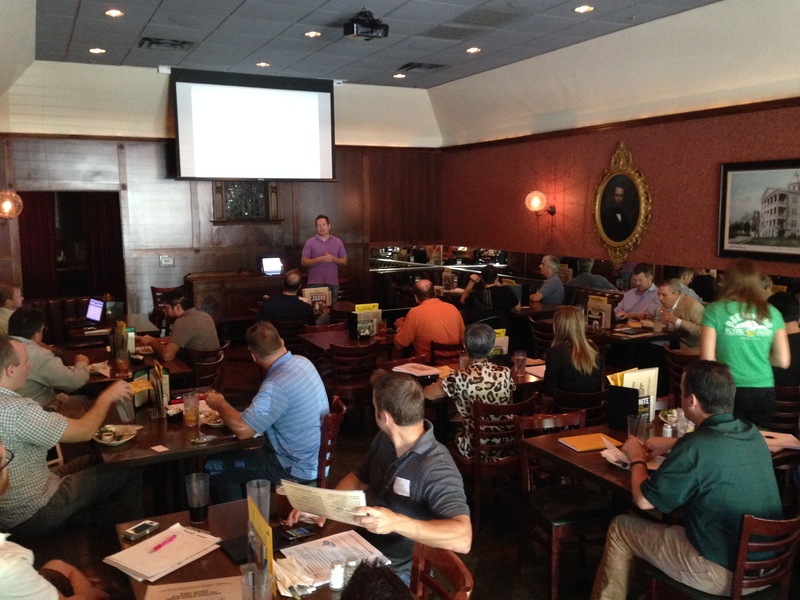 Jeremy Palmer talked about how rich snippets, and other copywriting secrets, can increase your click through rate and explode your traffic at the Affiliate Summit Meetup in Austin, TX on September 24, 2013. There was also a lively Q&A time where Jeremy helped lots of folks with their questions about making search listings more appealing. Thanks a lot to Jeremy and everybody that came out for some lunchtime shop talk. Affiliate Summit East is heading back to New York City in 2014, and we’ll be in a new spot… deep in the heart of Times Square. 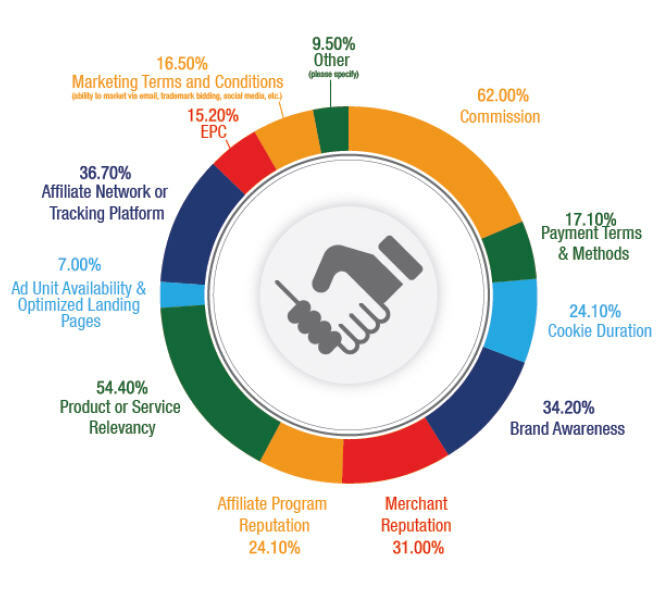 Affiliates were asked “When selecting a merchant to promote, what are the top three factors that sway your decision?” for the 2013 Affiliate Summit AffStat Report. Commission was most important with 62% of affiliates, followed by product or service relevancy at 54.40%. The affiliate network or platform, brand awareness, and merchant reputation were also important factors. Personally, the relevancy is most important to me. Commission is not a factor if the product or service doesn’t resonate with your audience. The Affiliate Summit room rate will be available until December 9, 2013 or until the group block is sold-out, whichever comes first. Please be sure to register for Affiliate Summit before booking your hotel. We have a limited number of rooms, and when they fill up, anybody not registered for Affiliate Summit is subject to losing the discounted rate. To book your reservation at Paris Las Vegas, secure your room online, or call 877-603-4389 and ask for the Affiliate Summit rate and provide Group Code SPASI4. More information on the Affiliate Summit West 2014 travel page. I made my first post for this blog nearly 10 years ago, and back then I was on Blogger. Next up, I spent some time with Movable Type, and moved on after hearing over and over about how much more intuitive WordPress was over the other platforms. I decided to move my hosting to WP Engine, but I was dreading the actual migration. Then I remembered that David Vogelpohl, who just spoke at Affiliate Summit East 2013 on creating highly converting WordPress sites, offered a WordPress migration service called We Move WP. I was able to outsource the migration of my design, content, databases, themes and plugins for $299, and that was so worth it to me. This blog has all sorts of legacy nightmares from a decade of action, and I was imagining multiple days of trying to bring it back on WP Engine just how I wanted it. Instead, David and his team took care of everything, and it was carefree for me. I am so happy I did it this way – thanks We Move WP! Affiliates were asked “Do you typically promote products and services geared towards consumers or businesses?” for the 2013 Affiliate Summit AffStat Report. The results revealed that few affiliates, just 1.3%, are solely focused on B2B (business to business). However, nearly a third (29.7%) are promoting both B2B and B2C (business to consumer) products and services. This could be an interesting opportunity for affiliates looking to focus on B2B niches. Affiliate Summit West 2013, the premier affiliate marketing conference, took place August 18-20, 2013 at the Pennsylvania Convention Center in Philadelphia, PA with over 4,000 affiliate marketers. The keynotes for Affiliate Summit East 2013 were Rae Hoffman, Dr. Randal Pinkett, and Wil Reynolds. See highlights from the conference, as well as some of what you missed if you didn’t make it to Affiliate Summit East 2013.